Additionally each task can have conditions applied which are evaluated before deciding to execute the task or not. Some tasks are fixed and require no further properties to be applied. Other tasks can have further properties applied that can retrieve information from the group or project or pass information into the specification. When a task is selected, its properties are shown in the Properties window. All tasks have a "Title" property which can be used to give the task a descriptive name. Depending on the type of task, there may be extra properties. Each property can be made dynamic - see individual tasks for more information. If you build a rule for property, then DriveWorks needs to have the project open to calculate it, which means even if the specification is going from one Paused state to another, DriveWorks will open the project and then close it again which may affect the performance of the project, particularly with Excel Projects. To build a static value, type the value into the box next to the property name in the property grid. To build a rule, click the property name, and then click the ellipsis "..." button that appears to launch the rule builder. Additional categories will appear if you have an appropriate PowerPack installed. 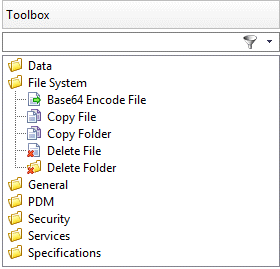 The Toolbox list can be be filtered by using the filter at the top of the list.